It’s hard to imagine that with the lengths Mattel are going to, to give Barbie a makeover that is more relevant to the current culture of girls, women and female empowerment, they would miss an opportunity for diverse representation. Alas, that is the case, but one young woman has taken steps to identify the problem, and create a solution. Haneefah Adam is a postgraduate medical student from Nigeria, who also runs a blog called Muslimahanie which is a lifestyle and fashion blog for millennial Muslim women. Despite seeing various incarnations of Barbie over the past few years, including more empowering career choices, Barbies modeled on real life female role models, and a wider range of body shapes to choose from, Haneefah was disappointed in the lack of Barbie’s representing the millions of Muslim girls around the world who are passionate about fashion and style. After browsing through a Barbie style page and not seeing any doll dressed like her, she decided to buy a Barbie, dress it up like her, and take pictures of it. 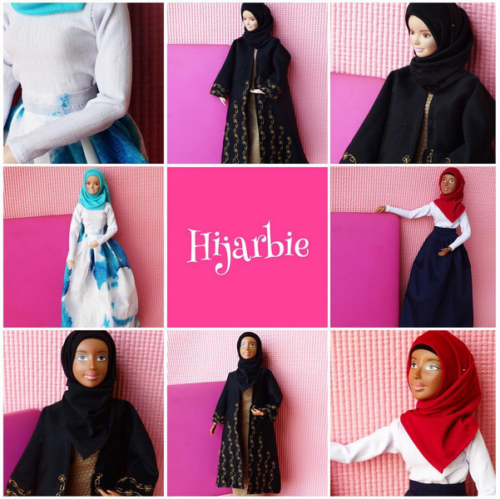 Toward the end of 2015 she created an Instagram account called @Hijarbie showing pictures of Barbies dressed in modest Muslim fashion, and it quickly became an internet sensation. “I was a little bit surprised [by its success], but then, most people haven’t seen something like that before,” she told Al Jazeera in an interview in February. At the time of that article being published, she already had close to 35,000 followers, but today she has over 72,000! “I set up the account initially to create an avenue to make modest outfits for dolls, because I haven’t really seen one before. Before I created the account, I hadn’t seen a doll in hijab that had her own account and personality. This account provided that hijabi style avenue,” she said. In the Barbie’s World Collection, Al Jazeera reported it features a Venetian Muse, Tribal Beauty, Maiko and Inuit Legend, but no hijab-wearing doll. Haneefah is not trying to make any sort of overtly political statement, she insists it is more about filling a gap in the Barbie world and presenting a positive and empowering view of Muslim girls to the world. “I’m filling a gap and hoping to create a positive awareness for the Muslim girl. I want her to be inspired. This is about creating an alternative and having toys that look like you, which, at the end of the day, leads to better self-esteem,” she told Dazed magazine. She also wants to speak to the growing movement of modest fashion that has been a huge hit with Muslim fashionistas around the world. With various fashion events and online destinations geared specifically toward the Muslim identity and sensibilities, Haneefah understands why created her own range of Hijarbie would be such a hit with her followers. “Fashion-conscious Muslim women in the form of bloggers have been taking center stage for a good few years, showing the world that style can coincide with faith. In 2015, H&M, the second-largest fast-fashion consumer outlet in the world (after Zara), made international headlines when they released a video for a sustainable fashion collection featuring a model wearing the hijab. UK-based model Mariah Idrissi, 23, who is of Pakistani and Moroccan heritage became the center of many discussions about how the Muslim identity fits into mainstream fashion. That level of inclusiveness from such a well-known brand shows how far we have come in terms of diversifying fashion to represent even more people. Haneefah’s passion to diversify Barbie’s image (which, as we’ve stated before, is by far the biggest selling doll in the world) is certainly paying off, as she has received a lot of positive feedback for her stylish images. “It’s been a hit with the parents, and older girls say they wished they had the dolls when they were little,” she said. She also emphasizes that a person shouldn’t have to feel like they are going against their beliefs to care about fashion, even amongst those who prefer more modest tastes. “The hijab is actually more about modesty than fashion but who says you can’t incorporate both together? Fashion with faith,” she said. Mariah Idrissi, the H&M model, told Fusion in 2015 why it feels good to be part of the mainstream conversations and imagery around fashion. “It always feels like women who wear hijab are ignored when it comes to fashion. Our style, in a way, hasn’t really mattered, so it’s amazing that a brand that is big has recognized the way we wear hijab,” she said. 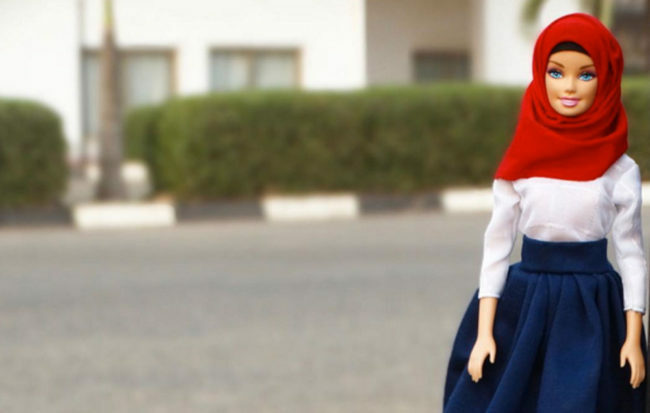 And while Mattel hasn’t made any formal announcement about adding a hijab-wearing doll to their various collections, the popularity Haneefah is experiencing shows the level of demand for modest and fashionable representations for young girls. But perhaps Mattel should be taking notice, because a recent study published in the Sept. 2016 issue of the journal Body Image, which asked 112 girls to play with the regular thin Barbies and the new fuller-figured Tracy doll came to an interesting and not-so-surprising conclusion. They found “girls tended to desire a body shape more closely aligned to the dolls with which they played.” The girls who played with the fuller figured dolls expressed less body dissatisfaction than the girls who played with the thin Barbies. Meaning, what they saw is what they aspired to be. Another study from 2006 which surveyed 162 girls in the UK, titled “Does Barbie Make Me Want To Be Thin” found “early exposure to dolls epitomizing an unrealistically thin body ideal may damage girls’ body image.” This is why we need Hijarbie and other more diverse representations in the Barbie range. 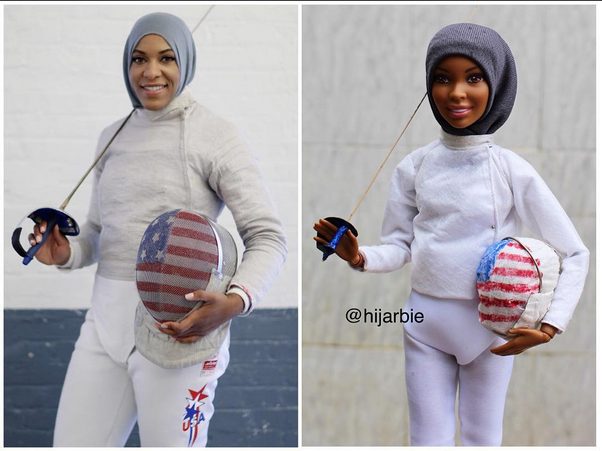 Some recent images on the Hijarbie Instagram account show the doll dressed up like a few female athletes who competed at the Rio Olympics. American fencer Ibtihaj Muhammad (the first US Muslim athlete to compete while wearing the hijab) and Saudi Arabian sprinter Kariman Abduljadayel (the first female sprinter to compete for her country) are featured on the account in a subtle nod to the way these real life women have become role models for many girls watching them. Mic.com reports that Muslim fashion is becoming a force to be reckoned with, where estimates show it could be a $327 billion industry by 2020. That leaves little confusion as to why something like Haneefah’s Hijarbie is such a huge success. We hope it will catch the attention of not just Mattel, but many other doll and toy manufacturers to understand the growing market today. You can follow Hijarbie on Instagram, and see more Muslim fashion on Haneefah’s blog. After browsing through a Barbie style page and not seeing any doll dressed like her, she decided to buy a Barbie, dress it up like her, and take pictures of it. 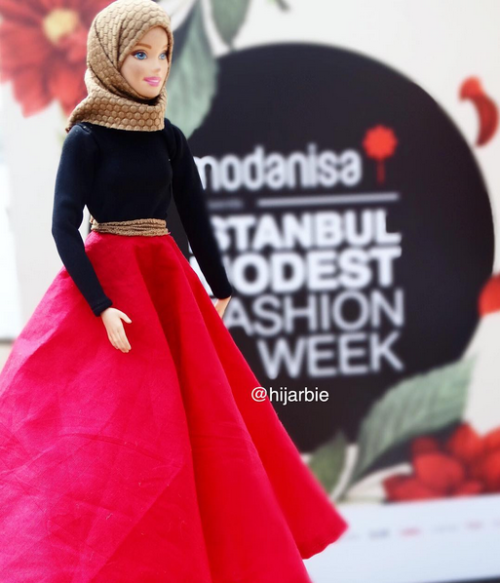 I think Hijarbie doll is the real symbol of “Fashion with Faith” as well as indication that fashion is moving behind faith to make new routes for it.